PIN code is entered using keyboard or onscreen PIN pad and Submit. Use Check All to quickly mark all students for check in or out. OR select Check-In or Check-Out beside a student's name. Click the Class Name button. Choose desired class from the Pick Class popup. Check All or Check-In individual students. 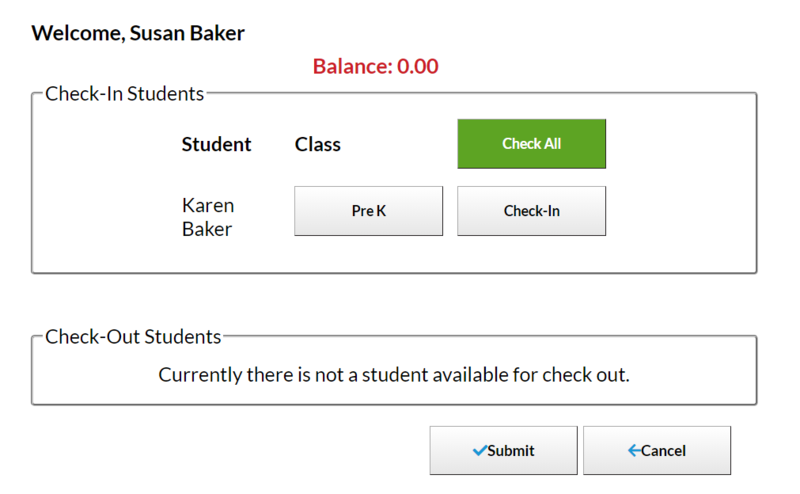 If the student is scheduled in only one class, it is not necessary to click the Class Name button. Family Balance - Note: displays for the Billing Contact only. Students their PIN is authorized to pickup. See Student Pickups. Personal Parent Portal Login Message, if applicable.